For many homeowners, the kitchen is the most important room in the house. It is the room that often sees the most active and therefore is the room that needs the most work. If a kitchen is not as functional as you like, it may be a good time to consider remodeling. 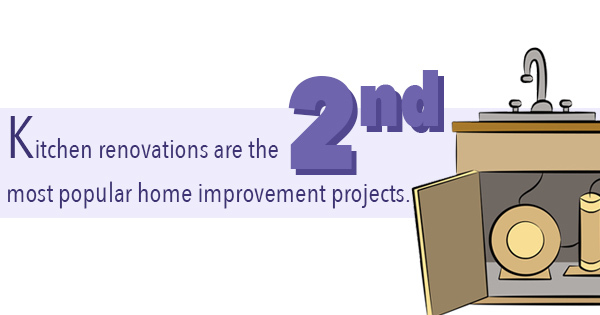 A survey by the National Association of Home Builders states that kitchen renovations are the second most popular home improvement projects, with 69% of homeowners stating they have already or plan to build or remodel their kitchen, and kitchen renovations account for 40% of money spent on home renovations. If your kitchen could use an update, here are a few remodeling ideas that can spruce up your kitchen and make your life a little easier. Cabinets are a big part of establishing the overall tone of your kitchen. Stainless steel cabinets can give your kitchen a sleek, sophisticated modern look. If you’re looking for a fun, quirky kitchen, try painting cabinet insets a different color for a multi-color effect. Or, create a fun pop with bright cabinets against a white wall. The key to having a clean kitchen is tons of storage, so consider adding features such as multi-level storage cabinets, or a built-in trash dispenser to clear up a cluttered kitchen. If you have too many pots and pans, consider placing a hanging rack by the oven for easy access. If your kitchen is too dark, install some windows to let in the light. If you don’t want to sacrifice your privacy for a little more light, consider using a few lines of glass window blocks instead. Adding lights underneath your cabinets can make preparing food on the counter easier, and can also be useful when searching for late night snacks. Large paper lanterns can create a mellow lighting and look great in the modern home. These kitchen remodeling ideas can breathe new life into your house, and even raise its value. It’s been estimated that even minor kitchen renovation and design projects can give homeowners a return on investment of 73%. Whether you do a full rebuild or decide just to switch things up with a fresh coat of paint, kitchen remodeling can be the perfect way to improve your house.